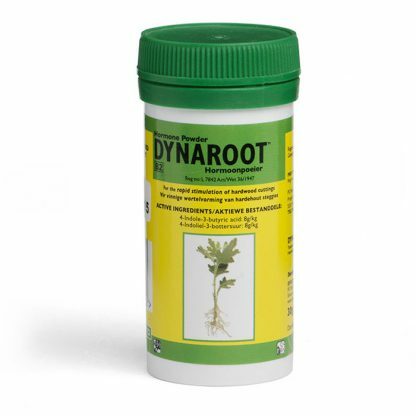 Dynaroot rooting hormone powder is used for the rapid stimulation of cuttings and has proven itself in many trials. Once the Dynaroot rooting hormone powder is applied, auxins are absorbed, resulting in the stimulation of root formation. Dynaroot rooting hormone powder produces very good results when used to root cuttings. Works well when painted on the live cambium of collected trees to promote rapid production of new roots. Used during laying, painted on the edge of the live cambium. Produces masses of roots. 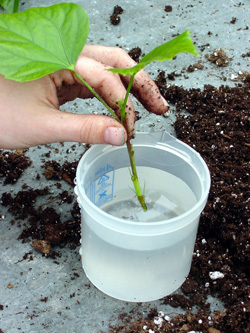 Cuttings: Moisten the lower tip of the cutting and dip this into the powder, shake off the excess powder and plant in the chosen growing medium. Yamadori: Clean the edges of the cut roots. Using a damp brush dipped into the powder paint it onto the green, living tissue. The powder should ideally be slightly pasty. Layering: After removing the bark from below where roots are desired clean the cut with a sharp blade. You can put a zig zag pattern into the upper cut to increase the surface area from where roots can emerge. Paint Dynaroot onto the edge all around the trunk or branch using a damp brush. The powder should be slightly pasty when applied for best results. Take a growing tip from your plant 3″ to 6″ long with at least one leaf internode, two is better but not always possible. (A leaf internode is where the leaf connects to the stem, See diagram 1). Make a cut approximately 1/4″ below the internode(s) where you just trimmed the leaves. Cut at a 45 to 60 deg. angle. (See diagram 3). Hold the back-up block tightly behind the stem where you are going to cut. 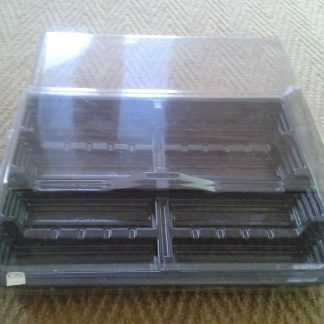 This supports the stem and protects your fingers. Make this cut as quick and clean as you can as you do not want to tear or crush the stem.